dBuffalo Neuroimaging Analysis Center (R.Z. ), Department of Neurology, University of Buffalo, Buffalo, New York. SUMMARY: Myelitis and optic neuritis are prototypic clinical presentations of both multiple sclerosis and neuromyelitis optica. Once considered a subtype of multiple sclerosis, neuromyelitis optica, is now known to have a discrete pathogenesis in which antibodies to the water channel, aquaporin 4, play a critical role. Timely differentiation of neuromyelitis optica from MS is imperative, determining both prognosis and treatment strategy. Early, aggressive immunosuppression is required to prevent the accrual of severe disability in neuromyelitis optica; conversely, MS-specific therapies may exacerbate the disease. 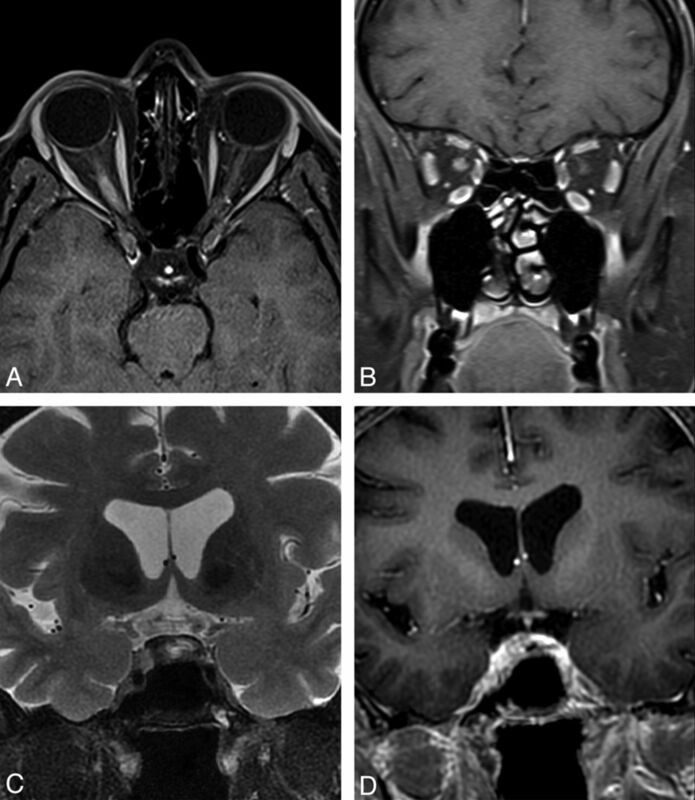 The diagnosis of neuromyelitis optica requires the integration of clinical, MR imaging, and laboratory data, but current criteria are insensitive and exclude patients with limited clinical syndromes. Failure to recognize the expanding spectrum of cerebral MR imaging patterns associated with aquaporin 4 antibody seropositivity adds to diagnostic uncertainty in some patients. We present the state of the art in conventional and nonconventional MR imaging in neuromyelitis optica and review the place of neuroimaging in the diagnosis, management, and research of the condition. The identification of AQP4 antibodies in patients with only a single index event, in some patients with relapsing optic neuropathy,7 and in patients with more recently recognized patterns of cerebral disease8 predicts progression to NMO9⇓–11 and has led to the introduction of the term “NMO spectrum disorder. ” However, false-positive AQP4 antibody results have been reported in patients with definite MS, and the classification and pathogenesis of clinical and radiologic syndromes consistent with classic relapsing NMO, but without serum AQP4 antibodies, remain uncertain. Current diagnostic criteria (Table 1) still mandate the occurrence of both optic neuritis and myelitis and at least 2 of 3 supportive criteria, including longitudinally extensive spinal cord lesion (LESCL), seropositivity for immunoglobulin G antibodies that bind AQP4 on astrocytes, and brain MR imaging nondiagnostic for MS.12 While the presence of LESCLs is the radiologic signature of NMO, the spectrum of MR imaging changes associated with the condition has been significantly expanded by the recognition of an array of characteristic brain lesion patterns8 and the introduction of multiparametric and advanced MR imaging techniques in the assessment of the disease. Neuroimaging has an increasingly important role in both the diagnosis and management of this potentially devastating condition. First, timely differentiation of NMO from MS is critical and the motivator for this review: Early and aggressive immunosuppression is required to prevent or reduce potentially severe disability in NMO, whereas the application of MS-specific therapies can exacerbate the disease13,14 or even precipitate severe atypical relapses.5,15 Second, serial imaging has an important role in disease monitoring and informs understanding of the temporal aspects of NMO pathophysiology. Third, routine imaging surveillance is necessary to monitor for complications of immunosuppressive therapy. In this review, we summarize state-of-the-art conventional and nonconventional MR imaging in NMO and its place in the clinical management and research of the disease. The presence of LESCLs (≥3 vertebral segments) that preferentially involve spinal central gray matter is characteristic of NMO.12,16 LESCLs in NMO are T2 hyperintense and frequently T1 hypointense. They may acutely expand the cord and patchily enhance throughout their length (Fig 1A–C). T1 hypointensity16⇓–18 and cord atrophy (Fig 1D)19 are prominent findings in established NMO, reflecting the severity of tissue injury and a propensity for recurrent bouts of inflammatory activity to occur in old lesions. In such cases, we have observed short segments of gadolinium enhancement within pre-existing T2 LESCLs during acute spinal relapse (Fig 1A, -B). Additionally, short-segment T2-hyperintense lesions are described in NMO20 and should not necessarily deter one from the diagnosis, particularly in the presence of other typical neuroimaging findings. While cord pathology in NMO is traditionally associated with a severe clinical phenotype, including the need for ventilatory support in association with high cervical lesions, excellent clinical and radiologic recovery may be seen in some patients. This observation implicates reversible vasogenic edema, a phenomenon described in cerebral NMO lesions8 and attributed to transient functional impairment of water transport mediated by AQP4 antibodies,21,22 in the pathogenesis of some NMO cord syndromes. A, T2WI shows extensive patchy pericentral signal change extending from the cervicomedullary junction to the T1 vertebral level in acute symptomatic spinal AQP4-positive NMO. B, Contrast-enhanced T1WI shows that short-segment gadolinium enhancement is present within the cord at the C4 and C7/8 vertebral levels. C, T2WI shows prototypic longitudinally extensive holocord inflammation in acute symptomatic AQP4-positive NMO relapse. D, T2WI shows severe atrophy in a chronic thoracic spinal cord NMO lesion spanning 3 vertebral segments (T2–T4). Although a confluence of multiple short-segment MS lesions may occasionally mimic the MR imaging features of spinal NMO, contiguous T2 hyperintensity of central gray matter over many segments is rarely observed in MS.12,16 Differentiation of spinal NMO and other immune-mediated myelitides, such as those associated with Sjögren disease or systemic lupus erythematosus, is more difficult; long cord lesions with a severe clinical phenotype are well-described in the context of systemic autoimmunity (Table 2).23,24 However, autoantibodies directed to antigens other than AQP4 are often also detectable in NMO sera,25,26 and a proportion of patients have clinical features of systemic autoimmunity. Of 8 patients with Sjögren syndrome–associated myelopathy identified by Kim et al,27 7 met the diagnostic criteria for NMO, and AQP4 antibodies were present in 4/5 patients whose serum was available for testing. It is, therefore, likely that many of the Sjögren syndrome–associated myelopathy cases described before the advent of AQP4 antibody testing had coexistent NMO. 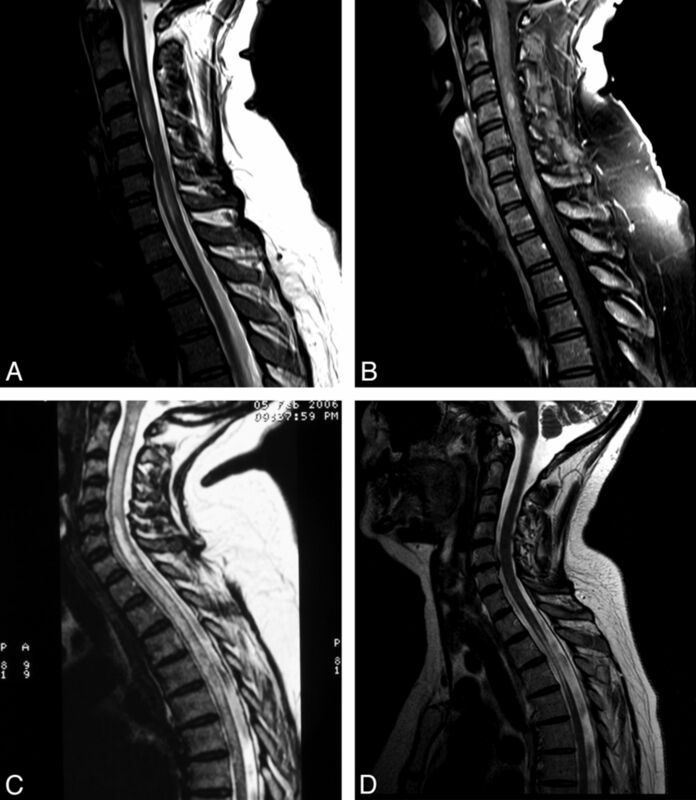 Other inflammatory disorders that should be considered in patients with LESCLs include neurosarcoidosis and postinfectious myelitis; while surface enhancement due to meningeal involvement is more common in these conditions, they may be indistinguishable from spinal NMO on radiologic grounds. While rare, paraneoplastic myelitis merits consideration in patients with an isolated LESCL, and testing for serum antibodies to onconeural antigens, including collapsing response mediator protein 5, amphiphysin, or glutamic acid decarboxylase, is advisable in such cases.28 Infective and metabolic myelitides are rarely confused with NMO on clinical grounds and are beyond the scope of this review. Of the noninflammatory causes of LESCL, spinal dural arteriovenous fistula is perhaps the most important treatable differential diagnosis. A and B, Contrast-enhanced fat-suppressed T1WI shows acute swelling and enhancement of the right optic nerve during symptomatic AQP4-positive NMO relapse with severe right-eye visual loss. C, Fat-suppressed T2WI. D, Contrast-enhanced fat-suppressed T1WI shows chiasmatic hyperintensity and enhancement during symptomatic AQP4-positive NMO relapse with severe visual impairment affecting the entire field of vision in the left eye and the temporal hemifield of the right eye. Periependymal/periventricular lesions in acute AQP4-positive NMO. A, Contrast-enhanced T1WI shows ill-defined periventricular cloudlike enhancement. While relatively specific for NMO, similar patterns can be observed in other inflammatory CNS diseases, such as active neurosarcoidosis (B, Contrast-enhanced T1WI). C and D, T1WI and contrast-enhanced T1WI demonstrate pencil-thin ependymal enhancement involving the anterior horns of the lateral ventricles in AQP4-positive NMO. E, Contrast-enhanced T1WI shows thick periependymal enhancement around the posterior horn of the lateral ventricle in acute symptomatic cerebral AQP4-positive NMO relapse. F, 3T follow-up FLAIR MR imaging shows ventriculomegaly and periventricular encephalomalacia and gliosis. G and H, FLAIR MR imaging and contrast-enhanced T1WI shows extensive periependymal disease involving the right lateral ventricle and a discrete, well-demarcated enhancing lesion abutting the posterior horn of the left lateral ventricle. Nonspecific punctate or small (<3 mm) lesions in the deep or, less commonly, subcortical white matter are frequent8,9,32,33 and usually asymptomatic. Such lesions may appear MS-like in 10%–12.5% of cases,12,19,32,38 and in most series, only occasionally fulfill the Barkhof criteria39 for the diagnosis of MS in patients who are seropositive for AQP4 antibodies.20 To the authors' knowledge, the Magnetic Resonance in Multiple Sclerosis (MAGNIMS) criteria for dissemination in space, which have been incorporated into the most recent iteration of the McDonald criteria for the diagnosis of MS,40 have not been formally evaluated in patients with NMO. Periependymal/periventricular and corpus callosum lesions situated in proximity to the lateral ventricles are common to both MS and NMO. However, the radially oriented, well-demarcated perivenular lesions (Dawson fingers) that characterize MS are absent in most (but not all) cases of NMO; rather, NMO lesions tend to extend along the walls of the lateral ventricles in close association with the ependymal lining (Fig 4). Extension into the white matter of the hemispheres may form large, confluent lesions. 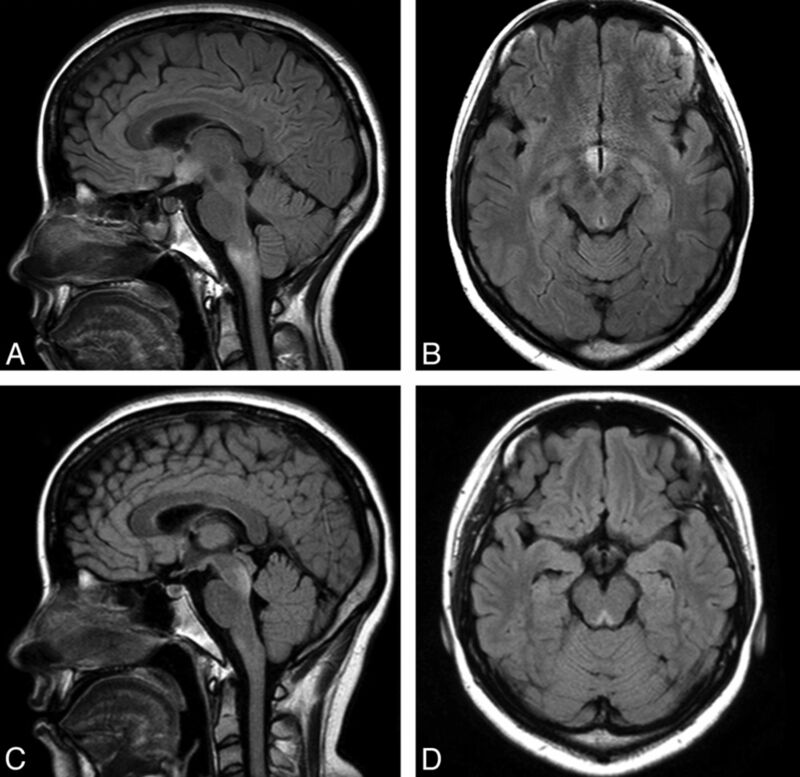 Multiple, edematous lesions with heterogeneous signal intensity (higher in the rim and lower in the core of the lesions) in the body of the corpus callosum (“marbled pattern”),47 and diffuse involvement and swelling of the splenium may be notable in the acute phase of the disease (Fig 5A–C). Such lesions may diminish in size and intensity or even disappear on follow-up imaging47; however, chronic cystic changes have been described in the genu and splenium of corpus callosum,34 and we documented severe atrophy of the callosum at 2.5-year follow-up in 1 case (Fig 5D). 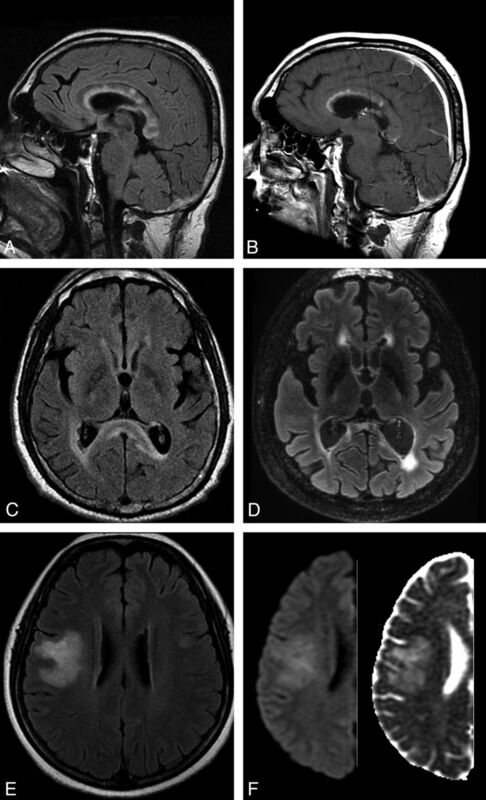 Large, confluent, and heterogeneous lesions occur in the cerebral hemispheric white matter in some cases of NMO (Fig 5E), possibly with a predilection for patients from the Far East and Africa and among children.48 These lesions do not exert mass effect9 and often vanish following steroid therapy or, in some cases, spontaneously. The pathology of these lesions, which may be contiguous with periependymal lesions or have a “spilled ink” appearance along white matter tracts,8 is uncertain, though nondestructive intramyelinic edema has been described in some pathologic studies.21 The evanescent nature and presence of facilitated diffusion (Fig 5F)49 within lesions also implicates vasogenic edema, potentially due to a reversible or limited astrocytopathy, as the underlying pathology.21,22,50 Hemispheric lesions may be clinically silent or result in focal neurologic deficits. Unilateral or bilateral, longitudinally extensive lesions involving the corticospinal tract occur commonly in Korean patients8,9 and have occasionally been reported in other cohorts.32,51 Such lesions may be associated with severe contralateral motor deficits. A and C, FLAIR MR imaging shows acute, heterogeneous, “fluffy,” corpus callosum lesions, with prominent splenial hyperintensity and swelling, during symptomatic cerebral AQP4-positive NMO relapse. B, Contrast-enhanced T1WI shows linear enhancement involving the undersurface of the corpus callosum in its anterior third and more focal enhancement within lesions in the body of the corpus callosum. D, 3T follow-up FLAIR MR imaging at 2.5 years shows severe splenial (and global cerebral) atrophy. E, FLAIR MR imaging shows a large, evanescent lesion in the right hemisphere in AQP4-negative NMO spectrum disorder. F, DWI (left) and ADC map (right) confirm facilitated diffusion in the lesion. While most reported NMO brain lesions do not show gadolinium enhancement, the frequency of acute lesional enhancement is unknown. Patchy enhancement with blurred margins (“cloudlike enhancement”) in cerebral lesions has been reported as relatively specific for NMO (Fig 4A),8,52 and the presence of asymptomatic “pencil-thin ependymal enhancement” (similar to that observed in infectious ependymitis) may serve to further differentiate the condition from MS (Fig 4C, -D).53,54 Rarely, NMO lesions exhibit a solid enhancement pattern that is indistinguishable from acute MS (Fig 4G, -H). Incomplete ring enhancement, a common feature in larger, acute MS lesions, has not, to the authors' knowledge, been described in NMO. The recent application of advanced imaging techniques to NMO, including ultra-high-field MR imaging (7T),55 magnetization transfer (MT) imaging,56,57 double inversion recovery imaging,58 DTI,56,59⇓–61 MR spectroscopy,57,62,63 iron-deposition imaging,64 and MR volumetric/morphometric assessments,56,58,65 is beginning to yield important insights into disease pathogenesis and to build on the MR imaging signature of the disease that has emerged from conventional imaging studies during the last 15 years. In addition, multiparametric approaches may provide complementary information in establishing nonconventional MR imaging patterns unique to patients with NMO (On-line Table). The presence of cortical lesions is almost universal in longstanding MS, and recent pathologic and imaging studies show that cortical pathology is common, even at first presentation.66 Cortical pathology correlates better with cognitive and motor parameters than white matter T2 lesion burden in MS,67 and gray matter atrophy has gained acceptance as an outcome measure in therapeutic clinical trials. In NMO, neuropathologic studies have thus far failed to demonstrate cortical pathology,68 though patient numbers studied are relatively low. Calabrese58 recently used double inversion recovery imaging, a technique that can reveal up to 18% (37% with retrospective scoring) of the histopathologically confirmed cortical lesion load in MS,69 to study 30 patients with NMO, 30 with relapsing MS, and 30 healthy controls. While more than two-thirds of the patients with relapsing MS had cortical lesions, none were demonstrable in either patients with NMO or healthy controls. Mild regional reductions in cortical thickness, determined by using FreeSurfer (http://surfer.nmr.mgh.harvard.edu/) in the precentral, postcentral, and calcarine gyri, and a mild reduction in thalamic volume were observed in patients with NMO versus healthy controls. The authors attributed these changes to secondary axonal degeneration following severe spinal cord and anterior optic pathway inflammation. Using an alternative approach, Kister et al55 found no cortical lesions in 10 patients with NMO spectrum disorder studied with ultra-high-field (7T); of 92 white matter lesions studied, only 8 were traversed by a central venule, a further distinction from MS that indicates a fundamental dichotomy in the pathogenesis of the 2 conditions. Voxel-based morphometry has been used to compare gray matter structures in NMO, MS, and healthy controls.56,65,70 Duan et al65 documented regional gray matter atrophy in the frontal cortex, temporal cortex, right inferior parietal lobule, and right insula of patients with NMO (n = 26) versus controls, but these differences lost statistical significance when a family-wise error correction for multiple comparisons at the voxel level was applied. Conversely, marked atrophy of cortical and deep gray structures was present in patients with relapsing MS, and compared with NMO, significant gray matter volume loss was present in the thalami, caudate, mammillary body, parahippocampal gyrus, right hippocampus, and right insula. Chanson et al70 observed volume loss in the thalamus in patients with NMO (n = 30) versus healthy controls (n = 30), and Pichiecchio et al56 found a reduction in the attenuation and volume of gray matter in the motor and visual cortices and regions associated with executive and language functions in patients with NMO (n = 8) versus healthy controls (n = 7) by using a similar voxel-based morphometry method (Fig 6A, -B). MT imaging has been explored in NMO, thus far with discrepant results: Rocca et al57 observed a reduced MT ratio in normal-appearing gray matter in 10 patients with NMO, suggesting occult gray matter damage, while Pichiecchio et al56 observed no differences in either the cortical or deep gray matter MT ratio between patients (n = 8) and healthy controls (n = 7). Finally, while iron deposition in the deep gray matter structures is described in MS71 and may contribute to disease progression,72 Chen et al64 found no evidence of abnormal iron deposition in the putamen, globus pallidus, caudate nucleus, thalamus, substantia nigra, red nucleus, or dentate nucleus by using quantitative 3D-enhanced susceptibility-weighted angiography in 42 patients with NMO compared with healthy controls. Voxel-based morphometry analysis shows a reduction in the attenuation and volume of gray matter in the motor (A) and visual (B) cortices in patients with NMO compared with the healthy controls. Voxel-based morphometry output is overlaid on the standard CH2 template. Voxelwise DTI analysis shows a significantly lowered fractional anisotropy along the pathway of the optic radiation bilaterally (C) and involvement of both lateral geniculate nuclei (D). Pichiecchio A, Tavazzi E, Poloni G, et al. Advanced magnetic resonance imaging of neuromyelitis optica: a multiparametric approach. Mult Scler 18(6):817–24, copyright © 2012. Reprinted by Permission of SAGE. In summary, nonconventional imaging data, while limited by small patient numbers and a variety of technical issues, indicate that the gray matter structures are less affected by NMO than by MS and, in particular, suggest that an absence of focal cortical lesions in NMO may differentiate the 2 conditions. In contradistinction to MS, the relative sparing of gray matter structures in NMO may explain the lack of a progressive phenotype in the condition. In patients with NMO and normal structural brain MR imaging findings, DTI has identified increased mean diffusivity and transverse (λ2,3) eigenvalues (reflecting the average diffusion coefficient perpendicular to the direction of maximal diffusivity) in the corticospinal tract and optic radiation, but not the cingulum or corpus callosum,60 implicating axonal degeneration secondary to spinal cord and anterior optic pathway lesions. Liu et al59 inferred the presence of subtle, widespread pathology in NMO normal-appearing white matter from an analysis of white matter connectivity matrices derived from deterministic tractography performed in 26 patients with NMO. In a more recent DTI study, Zhao et al61 confirmed the presence of occult damage to normal-appearing white matter in relapsing NMO but found that while mean diffusivity was increased in regions of interest in the optic radiation (and genu of the corpus callosum) versus controls, reduced values were observed in the internal capsule, thalamus, and medulla oblongata. Furthermore, Pichiecchio et al56 examined mean diffusivity histogram-derived metrics of normal-appearing white matter in NMO and healthy controls and found no significant differences, while tract-based spatial statistics in the same cohort identified lowered fractional anisotropy in the optic radiation bilaterally (Fig 6C, -D). 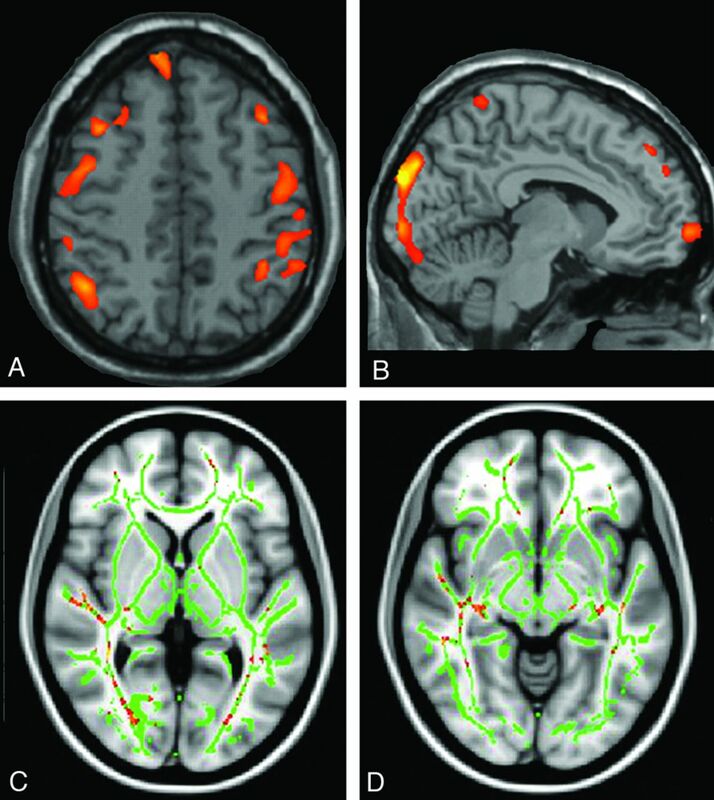 Quantitative structural brain assessment using SIENAX software (http://fsl.fmrib.ox.ac.uk/fsl/fslwiki/SIENA) has demonstrated a significant reduction in total white matter volume in patients with NMO (n = 30), even in the absence of T2 hyperintensities, versus healthy controls (n = 30).70 Regional voxel-based morphometry analysis in the same cohort identified possible volume loss clustered in the optic radiations and corpus callosum. Finally, the metabolic pattern of normal-appearing white matter in NMO/NMO spectrum disorder, as assessed by multivoxel chemical shift imaging at 1.5T56,63 and 3T62 with 1H-MR spectroscopy, is identical to that in controls. Taken together, these studies indicate subtle and, with the possible exception of the corpus callosum, selective structural alterations in the optic and motor pathways in the brain, implicating trans-synaptic axonal degeneration secondary to destructive lesions in the optic nerves and spinal cord, respectively. The normal spectroscopy data suggest that the diffuse degenerative process that affects the white matter in MS is lacking in NMO. However, variability in the severity of the disease and the exclusion of cases with brain abnormalities may have confounded the results of these studies, and larger multiparametric studies of well-phenotyped patients are required. Few studies have assessed the application of nonconventional MR imaging techniques to the spinal cord in NMO. Filippi et al17 were unable to demonstrate a difference in cervical cord MT ratio histogram metrics in clinically defined NMO (n = 8) versus MS (n = 10), despite cord T1 hypointensity and atrophy being restricted to the NMO cases. Two studies have used DTI in the assessment of cervical spinal cord damage in NMO. In the first, Qian et al73 showed abnormal DTI-derived metrics (especially fractional anisotropy) in the cervical spinal cord of patients with NMO (n = 10), even in the absence of signal alteration on conventional T2WI. Similarly, there was no correlation between diffusivity alterations and the number or extent of focal T2 hyperintensities in the cervical cord of patients with MS.74 In the second, Klawiter et al75 demonstrated higher radial diffusivity within damaged (as assessed by T2WI) white matter tracts in NMO (n = 10) versus MS (n = 10), consistent with the more destructive nature of the former condition. DTI metrics of damaged gray matter regions did not differentiate NMO and MS. These studies indicate that DTI may inform the pathology of spinal cord disease in NMO. Specific measures such as fractional anisotropy may provide quantitative biomarkers of white matter damage not readily identified by conventional MR imaging techniques. The seminal discovery of serum AQP4 antibodies in patients with NMO has validated earlier clinical and radiologic observations that separated the condition from conventional MS. While the presence of LESCLs suggests NMO and expedites referral for appropriate serologic testing, the absence of serum AQP4 antibodies in patients with classic clinical and radiologic features and their presence in patients with a spectrum of brain lesions have recently led to a re-appraisal of current diagnostic criteria for the disease. Recommendations by an international task force76 to include newly recognized imaging features of NMO, such as periependymal brain lesions, emphasize the importance of MR imaging in the diagnostic work-up of patients with CNS inflammatory disease. Greater scrutiny of brain MR imaging in patients with NMO has revealed an expanding array of lesion subtypes with which the neuroradiologist must become familiar. The integration of imaging with clinical and laboratory data in individual patients facilitates rapid differentiation of NMO/NMO spectrum disorder from MS. This distinction has critical therapeutic implications: NMO does not respond to traditional MS immunomodulatory therapy with β-interferon, which in some patients may even be deleterious.13,14 Similarly, severe exacerbations of NMO have been reported in patients treated with natalizumab,5 an efficacious monoclonal antibody therapy for MS. Case series do suggest that NMO responds to immunosuppressive therapy and, in particular, to the B-cell-depleting anti-CD20 monoclonal antibody, rituximab.77 Of relevance to the neuroradiologist, rituximab has been associated with progressive multifocal leukoencephalopathy in patients with systemic autoimmune disease,78 and heightened vigilance for this complication in patients with NMO is paramount. Nonconventional brain imaging is beginning to offer new insights into the pathophysiology of NMO and further differentiates the condition from MS. The lack of focal cortical lesions as assessed by ultra-high-field MR imaging and double inversion recovery imaging is of particular interest; if confirmed, double inversion recovery sequences may be helpful in distinguishing NMO from MS in difficult clinical cases. Early DTI, MT imaging, and MR spectroscopy data indicate an absence of diffuse “degenerative” disease in the normal-appearing white and gray matter in NMO, consistent with the lack of a progressive phenotype in this condition, an important distinction from MS that may also have therapeutic repercussions. Conventional and nonconventional neuroimaging investigations in NMO have accelerated in tandem with rapid developments in the understanding of NMO pathobiology during the past 5–10 years. These studies underscore the importance of neuroimaging in the diagnosis and monitoring of NMO and emphasize its role in directing the early commencement of targeted immunotherapy. The authors are grateful to Professor Jun-ichi Kira and Dr Koji Shinoda for kindly providing the images included in Fig 3. Disclosures: Michael H. Barnett—UNRELATED: Board Membership: Biogen Idec, Novartis, Bayer, Genzyme, Comments: Scientific advisory boards, Grants/Grants Pending: Novartis,* Payment for Lectures (including service on Speakers Bureaus): Novartis, Biogen Idec, Sanofi-Aventis, Genzyme, Comments: Independent scientific presentations, Travel/Accommodations/Meeting Expenses Unrelated to Activities Listed: Novartis. Yael Barnett—UNRELATED: Grants/Grants Pending: Biogen Idec. * Mahtab Ghadiri—UNRELATED: Grants/Grants Pending: Novartis,* Payment for Lectures (including service on Speakers Bureaus): Bayer, Travel/Accommodations/Meeting Expenses Unrelated to Activities Listed: Novartis, CSL, Genzyme. Lynette Masters—UNRELATED: Payment for Lectures (including service on Speakers Bureaus): Biogen Idec, Novartis, Comments: independent scientific presentation. Robert Zivadinov—UNRELATED: Consultancy: Biogen Idec, EMD Serono, Teva Pharmaceuticals, Genzyme-Sanofi, Novartis, Grants/Grants Pending: Biogen Idec, EMD Serono, Teva Pharmaceuticals, Novartis, Genzyme-Sanofi, Payment for Lectures (including service on Speakers Bureaus): Biogen Idec, EMD Serono, Teva Pharmaceuticals, Genzyme-Sanofi, Novartis. *Money paid to the institution. Y. Barnett was the recipient of the Biogen Idec Neuroradiology Fellowship at the Brain and Mind Research Institute in 2012. No specific grant support was obtained for this review. Y. Barnett codrafted the manuscript and assessed all included neuroimaging. I.J. Sutton provided important clinical input and revised the manuscript critically for important intellectual content. L. Masters reviewed the included neuroimaging. M. Ghadiri and R. Zivadinov revised the manuscript critically for important intellectual content. M.H. Barnett conceived and codrafted the manuscript. An extensive spinal cord lesion: tumour or inflammation?